Classically trained at the Leeds College of Music and with a music diploma to his name (LGSM), Adrians musical career spans nearly four decades. During this time he has produced twenty-three original albums, including his last, and highly acclaimed, solo album: Fierce Love which was released in 2013. And in 2016 / 2017, Adrian recorded and released his first live album: ‘Alpha and Omega, The Thirtieth Anniversary Recording’ where some of Europes finest musicians have come together to make this immensely powerful new recording of Adrians best selling album of the same name, originally premiered in Jerusalem in 1986. City of Peace commissioned by CMJ International. At the turn of the century, Adrian took a long break from live performing to work with author and playwright Murray Watts on ‘The Cry’, and to train as a music therapist. In 2002 he completed the post graduate diploma in Music Therapy (Dip.Mus.Th.) awarded by the University of Bristol through the Faculty of Medicine. ‘The Cry’ was released as an album in 2003 but didn’t receive its world premiere until 2008 in Saint Paul’s Cathedral, London. Adrian now practices as Music Therapist and Arts Therapy Consultant at; Three Ways Academy, Bath Opportunities Preschool, and Aspire Academy in his home town, Bath, where he works primarily with children and young people between the ages of four and nineteen with a variety of special needs. He also makes a yearly visit to Korce, Albania, where he works as music therapist amongst a variety of vulnerable children and adults. Both there, and in many places worldwide, he lectures and offers training in multi-sensory learning techniques and arts therapy principles of practice. 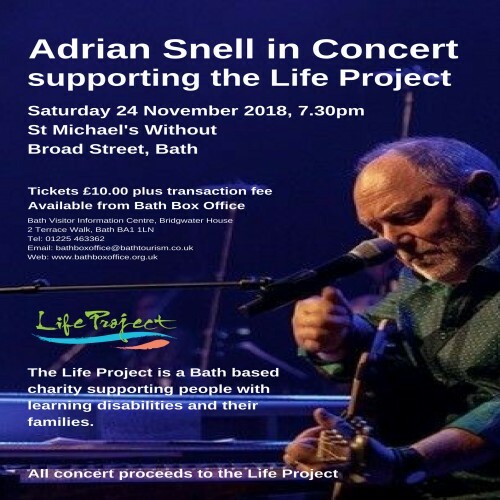 Adrian finally returned to the concert stage in 2015 and now seeks to integrate his skills and experience as composer, performer, recording artist, communicator and Music Therapist.